Haven't you always wanted to combine your love of handmade letterpress cards with your desire to passive-aggressively taunt strangers who wrong you? Yeah, me too. Well, good news: it's now easier for us. Inviting, an Austin-based letterpress boutique, offers a set of snarky parking cards that allow you send a pointed message through the dignified medium of letterpress printing. My set arrived nicely packaged with a handwritten note and a bonus letterpress gift tag. This is obviously a bit of a gag item, but any time you can turn one of life's frustrating moments into something that puts a smile on your face, it's a win in my book. 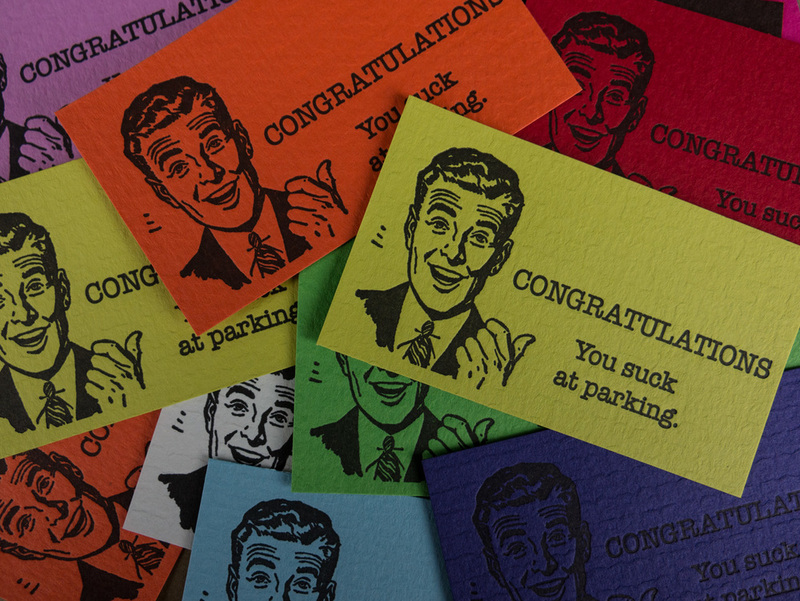 Grab some for your own glove box or as a stocking stuffer for that special curmudgeon in your life.